In this new print, the focus will be more on the expulsion from the Garden. This will be an opener for one of four chapters in the book/series I’m currently working on, God Is Our Witness. 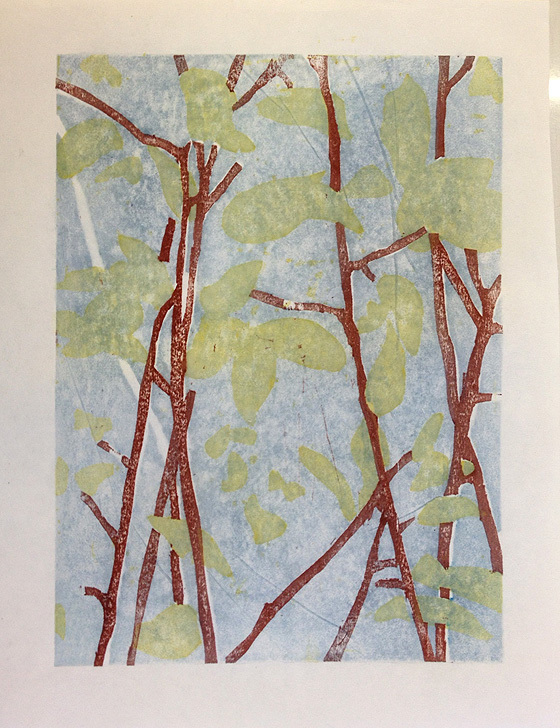 This past weekend I taught a mokuhanga workshop at beautiful Zea Mays Printmaking Studio in Florence, Massachusetts. This was the first time we’ve offered the workshop over three days instead of two days, and it was fantastic. Although it’s possible to learn the mokuhanga basics in a two-day format, it’s a tight squeeze. Three days allows for some spaciousness and an opportunity to experiment a bit with the printing. Here are some photos from the weekend. Enjoy! The Zea Mays teaching studio is lovely, with ample space for each student and lots of natural light. 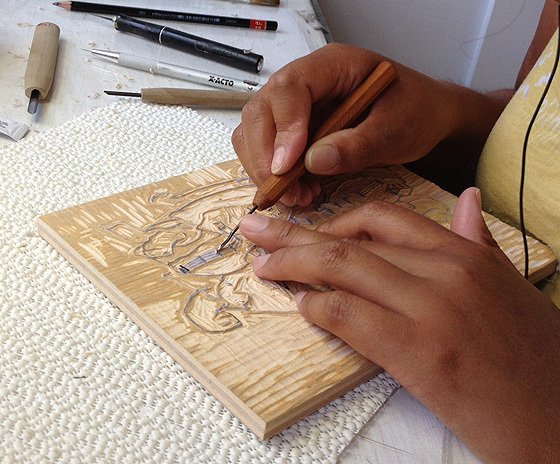 Carving a key block (the master outline for the print), which I tried to discourage, but everyone ignored me. 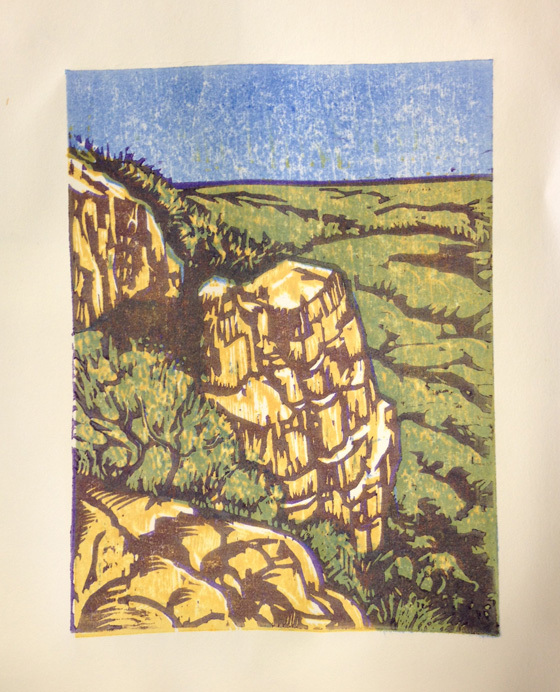 Great use of three colors in this landscape by Nancy, a local artist and illustrator. She preferred printing with wooden spoons over the traditional baren. 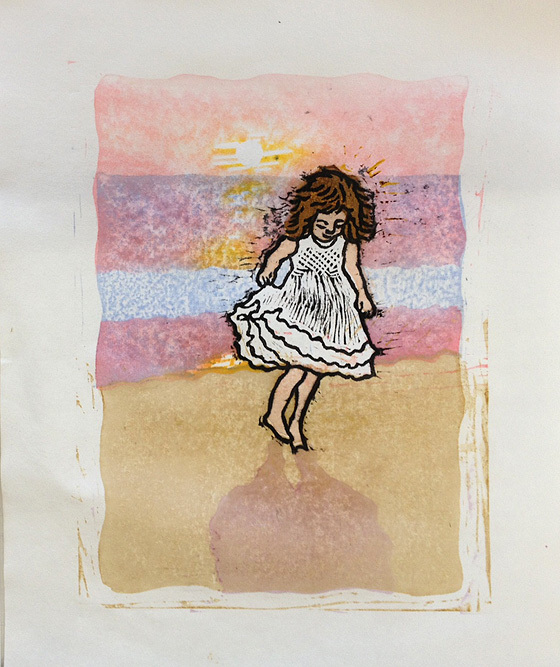 Nice detail, use of overprinting, and wonderful whimsy in this print by Diana, an artist/educator from Virginia. She's interested in illustrating children's books. Jill, an artist and art therapist, also ignored my suggestion to avoid fine linework, and she did a great job. I love the smocking on the upper part of the girl's dress. We learned at the end of the class that Jill's print is a self-portrait from when she was a child. 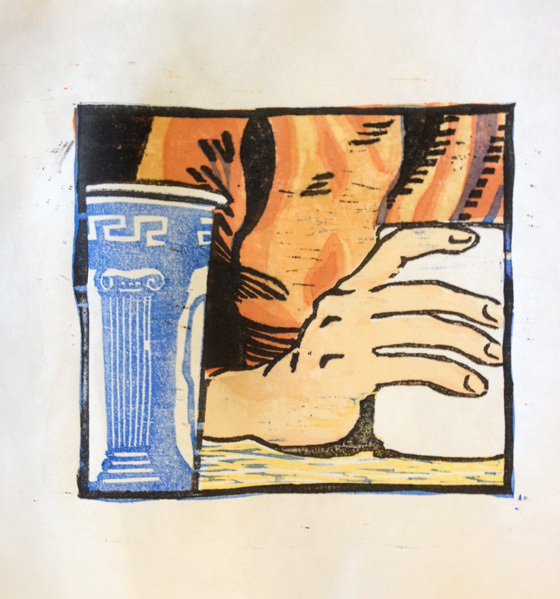 Kayla, an artist from Vermont, arrived with some blocks already carved, so she was able to spend more of her time printing. 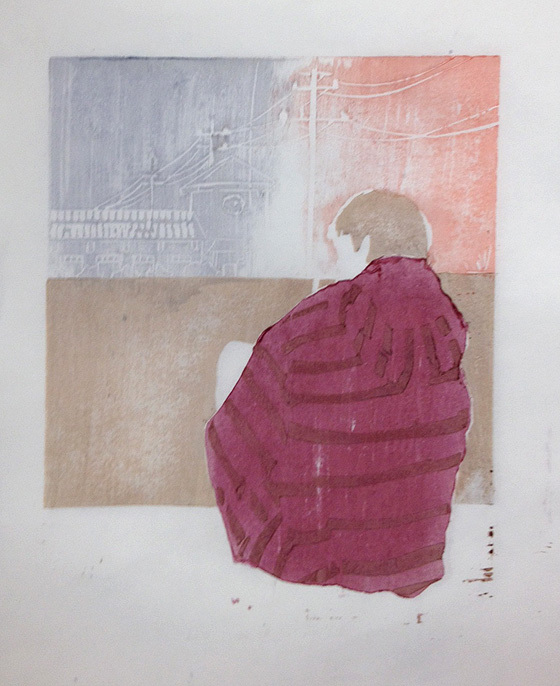 She tried some reduction work in the sweater and achieved a lot of rich color and depth. Gene decided to carve text -- another thing that I would have discouraged if anyone had asked me, and how good that she didn’t ask me! Gene is a sculptor who has also had some previous mokuhanga experience, and this image is a portion of one of her sculptural works. Lisa, a landscape painter, brought a lovely simplified sketch to work with. She breezed right through the delicate carving, but found the printing difficult. We were using registration boards rather than kento carved on the block, and because Lisa's image is a somewhat abstract image it was difficult when switching to a new block to remember how the previous block was oriented in the jig. After a few printing errors, she ended up marking the kento corner of each block. 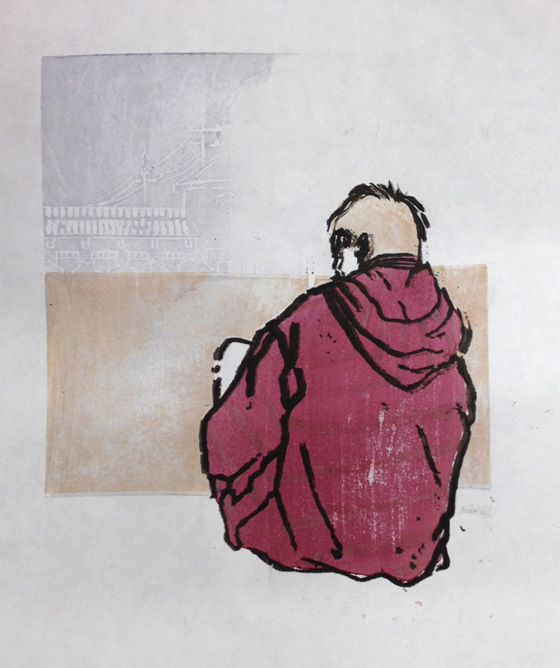 Rendez, an illustrator from Virginia, had a lot of ups and downs with his print. He had an experience I've often had, where the first few impressions are coming along really well and then one block just won't print right -- so frustrating. For Rendez it was the black keyblock that wouldn't cooperate. Here's one of his prints without the keyblock, though, and you can see he has some lovely subtle tones and white line work happening. 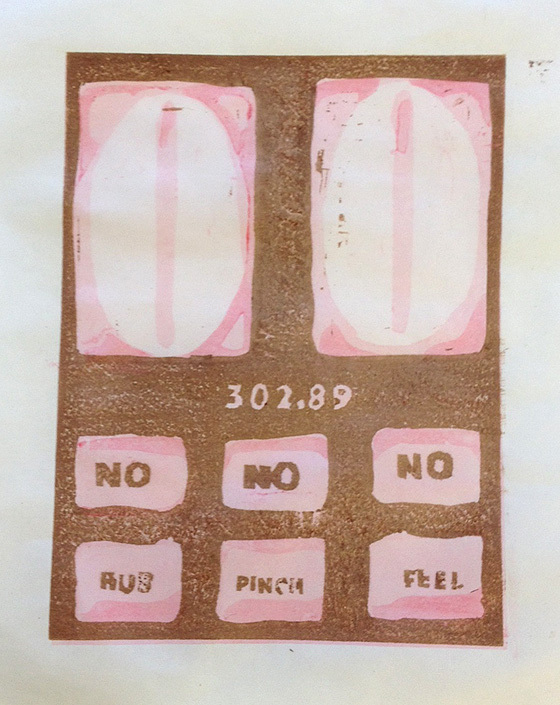 The group suggested that he might try printing the keyblock in a softer color -- a brown or a maroon tone. He took home some supplies to work on it more. 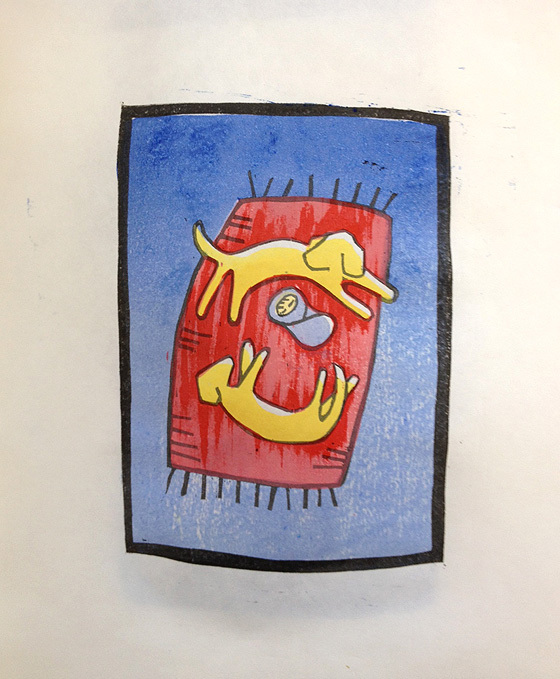 Roxy's sister has two yellow labs and is due to have a baby any minute now, so Roxy wanted to make this print to celebrate the occasion. The image itself is small and intimate, maybe 3" x 4" overall. Can't you just see it in the baby's room? Roxy also has had previous experience with mokuhanga. A big thank you to all 8 participants for a wonderful three days! I'll be teaching an introductory class again in the spring of 2014, probably in March. Check the Zea Mays web site in the fall for details. And if you’re someone who would be interested in an intermediate or advanced level mokuhanga class, please let me know. Once we have a large enough group interested, Zea Mays Studio is willing to host it. In 1875, seventy two Plains Indians were captured at Fort Sill, Oklahoma, and exiled to Fort Marion in St. Augustine, Florida, where they were subjected to military methods of ‘Indian assimilation’ under the direction of Lt. Richard Henry Pratt. Four years later, Pratt secured the permission of officials in the U.S. government to use a deserted military base in Carlisle, Pennsylvania, as the site of a school, and thus began the Carlisle Indian Industrial School. The Carlisle School was the first off-reservation Indian boarding school, and it became a model for Indian boarding schools everywhere. It was in operation from 1879 to 1918, and during that time more than 10,000 students passed through its doors. 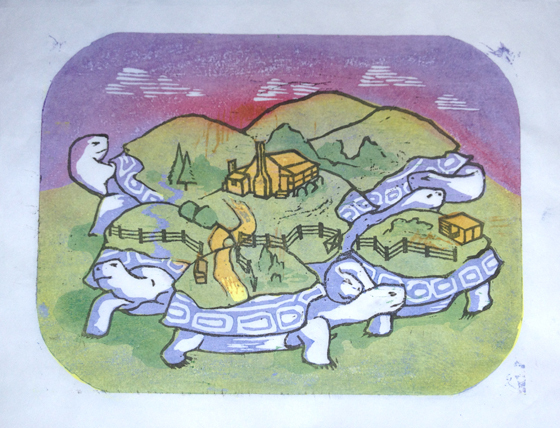 This print/drawing was created for a 72-artist project called Re-Riding History, curated by Emily Arthur, Martin Begaye, and John Hitchcock. Watch this space for news about where the project will be shown in the months ahead. While I was researching Plains Indian ledger drawings, I came across one that I found especially touching. It was a row of ten Indians, their backs to the viewer, dressed in ceremonial garb with their arms around one another. I knew instantly that I wanted to use this drawing in my piece for Re-Riding History. Technically, this drawing comes from a Plains tribe (Sioux) that was not represented among the 72 warriors who were incarcerated at Fort Marion, but the Sioux were involved in the Plains Wars during that same time period. In addition, between 1879 and 1918 over 1,000 Sioux students passed through the Carlisle Indian School, the school which Lt. Richard Pratt founded and ran after he developed his Indian assimilation methods at Fort Marion. Thus, the inclusion of these figures seems entirely appropriate. 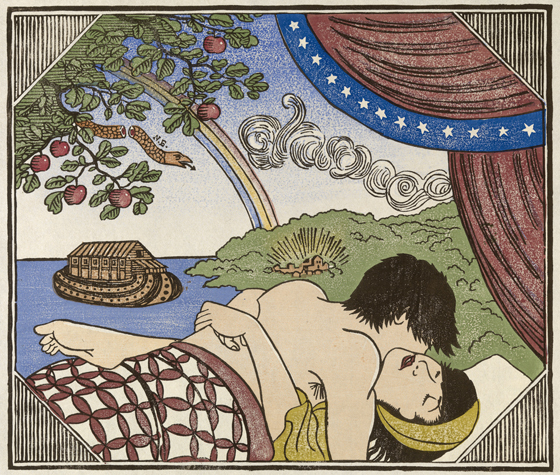 These figures were executed with pencil and colored pencil, as most ledger drawings were made. Using graphite and colored pencils on top of the ‘ledger’ print, I’ve added some pelicans and an alligator, both of which would have been completely strange to the 72 captured Plains Indians. Imagine the impression that the Plains Indians would have had of Florida. So much water! Hot and humid, it must have seemed like another universe. They were detained in dank Fort Marion on the water's edge. In the PBS documentary In the White Man's Image, historian Henrietta Mann says, “I’m sure it must have been a very apprehensive situation for them on the one hand to see so much water, because we believe that, as we go to live in that blissful place above, that we cross over four rivers. I’m sure they felt as if they were facing death.” She goes on to say that another clear omen occurred when Pratt removed their chains and ordered their hair cut, as cutting hair is a sign of mourning and death. As is almost always the case with art making, this piece is taking approximately twice as long as I expected. In addition to the usual “it takes how long it takes” truism, my 11-year old automobile died suddenly, and finding a replacement took me out of the studio for about 10 days. But I'm back, and ready to show you the printed ‘ledger paper’ I made. 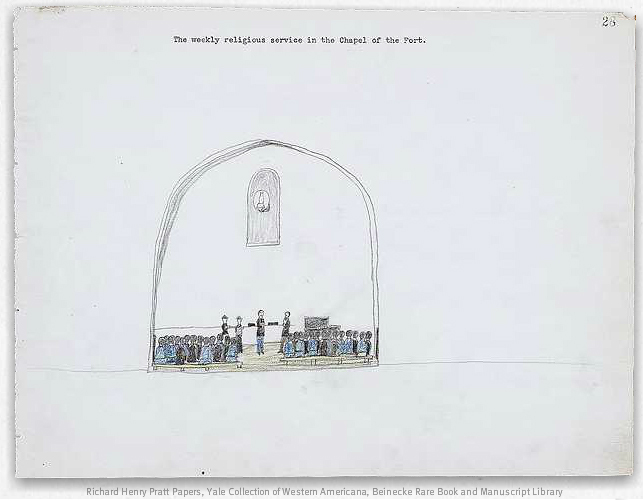 This is a drawing by one of the Fort Marion captives, a Kiowa-Mexican named Etahdleuh Doanmoe, depicting a religious service at the fort. The drawing comes from a sketchbook by Doanmoe which the Indians’ overseer, Lt. Richard Henry Pratt, kept and to which he added type-written annotations. I was struck by the stark emptiness of this page and the appearance that the little people were trapped inside a dome, like a snow globe. To me it reads loud and clear as a depiction of captivity and isolation. In 1992, PBS ran a documentary on their series “The American Experience” called In the White Man’s Image, a film that traces the development of Lt. Pratt’s methods for acculturating Native Americans into mainstream white culture. It begins with the story of the 72 captives at Fort Marion, where Pratt first used his methods, and continues with an examination of Pratt’s Carlise School for Indians, established in Pennsylvania in 1879. 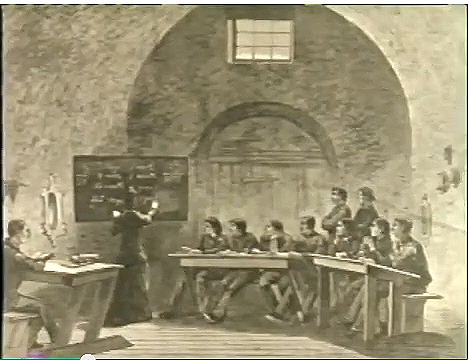 In that film I was interested to see this engraving, from Harpers Bazaar Magazine, of a classroom at Fort Marion. It looks quite a bit like Doanmoe’s drawing of the chapel service. Today I carved the portion of the piece that I’m making for the Re-Riding History project that will be printed -- the “ledger paper.” I want this piece to look like a real Plains ledger drawing, so I plan to print the part that would have been printed and draw the part that would have been drawn. I’ll do the drawing with colored pencil as the captured warrior artists would have done. I also want to make several copies, so it will be a small variable edition -- variable because of the hand drawing and coloring. I’ve got 8 sheets of paper prepped for this. Ledgers often have numbered pages, so I carved a number, 1875. That's the year that the 72 Plains warriors were captured and moved to Fort Marion in Florida. Tomorrow I’ll print this in a fairly pale blue.